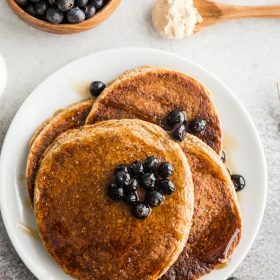 These Vegan Protein Pancakes are easy to make and the prefect vegan breakfast for any day! Add all of the ingredients to a blender and blend until very few lumps remain. Heat a skillet or griddle over medium heat and spray with cooking spray. Once hot, scoop the batter onto the griddle. I used about 1/2 cup per pancake but you can do more or less depending on the size that you want your pancakes. Cook the pancakes until the begin to bubble and a spatula is easy slid underneath; this take about 5 minutes. Flip and cook for an additional 5 minutes. Repeat until all of the batter is gone. Enjoy right away with your favorite toppings!